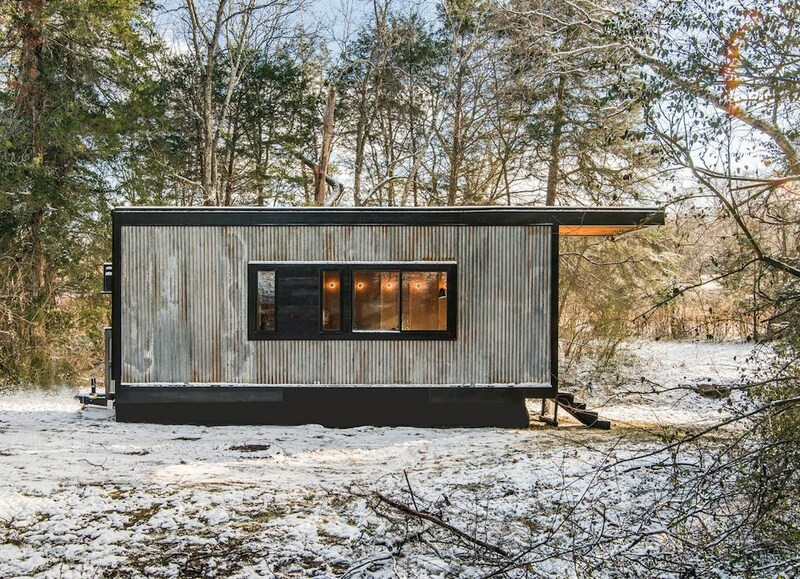 I’m also excited to submit The Cornelia Tiny House. A writing studio, library, and guesthouse commissioned by international bestselling author Cornelia Funke. Simple, enduring, rustic, elegance. A living sculpture inside and out, using only the best materials and craftsmanship available in the United States. Designed and built the New Frontier way. 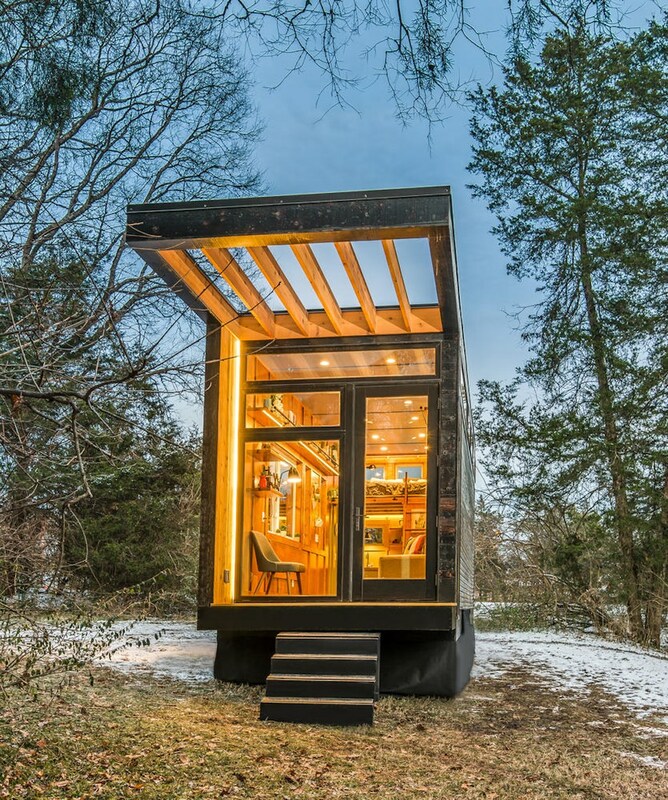 A guest tiny house that also serves as a writing studio for a popular author. 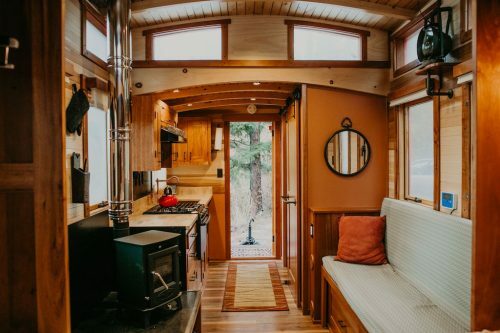 Built by New Frontier Tiny Homes. 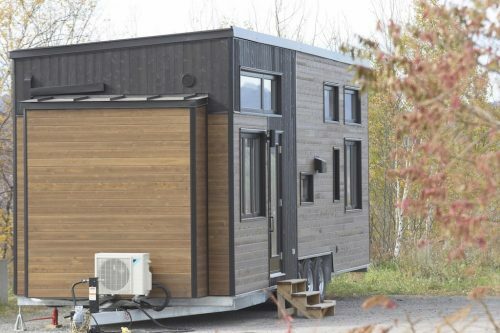 Do you have free build it yourself designs or budget 1st time tiny home info available? 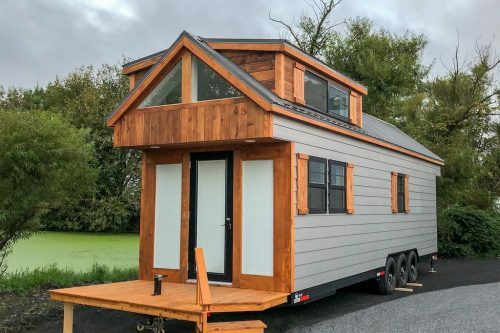 Looking to try it out and then get a dream tiny house for retirement. WOW. Very clever, modern and beautiful. The purpose for this structure was stated and it is ideally suited !! I like this arrangement very much as allows all of us to imagine adding a “ this or that” without adding size. I live in Asia so small spaces are very normal. If this “ Cornelia” lacks a shower it is not a big deal! Simply adding a floor drain with a slight sloop along with a wall mounted shower / instant water heater is great. Yes the toilet gets wet and the floor but SO??? It dries!!! 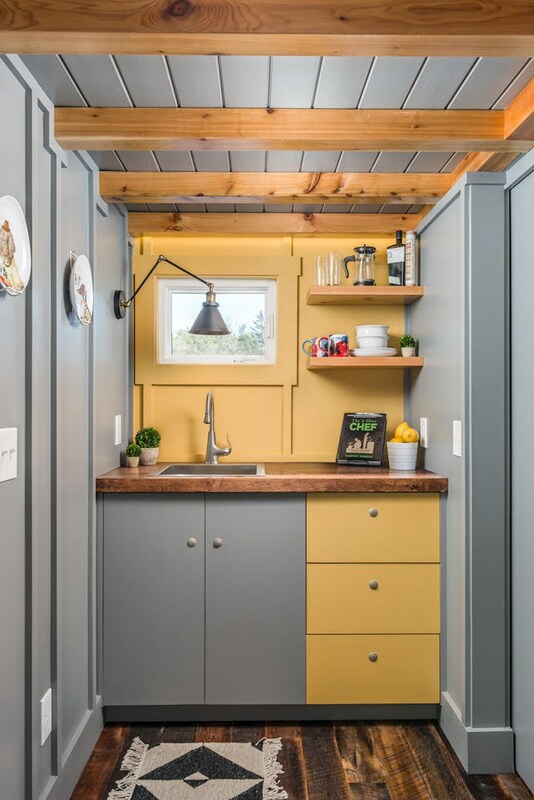 In that tiny attractive kitchen there is still room for a single burner stove, microwave and small appliances. Library ladder WOW!!! I’m very sure the TV will rotate off the wall and allow viewing from the sofa or loft. I appreciate very much this post as is very well thought out and easily expanded. I like this very much, I don’t think I saw a price on this one. This is really great. 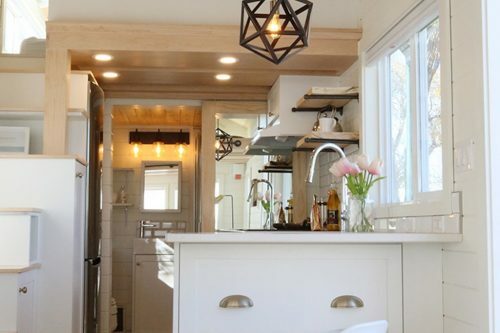 It’s amazing how clean the design becomes when the kitchen and bath functions are minimized. I love the finishes: this is the way to do wood: no excessive grain patterns making your eyeballs explode. The windows are great – amazing light and lovely views. The only flat furniture is the platform for the mattress and the flip up table/desk. No flat bottomed or flat backed couches to make your body scream in pain. A series of excellent choices. Yes – put a price to it and patent the design. Very buy-able. Does it not have a shower? Closer to being an emergency Shelter than a living space. Bring your C-rations. 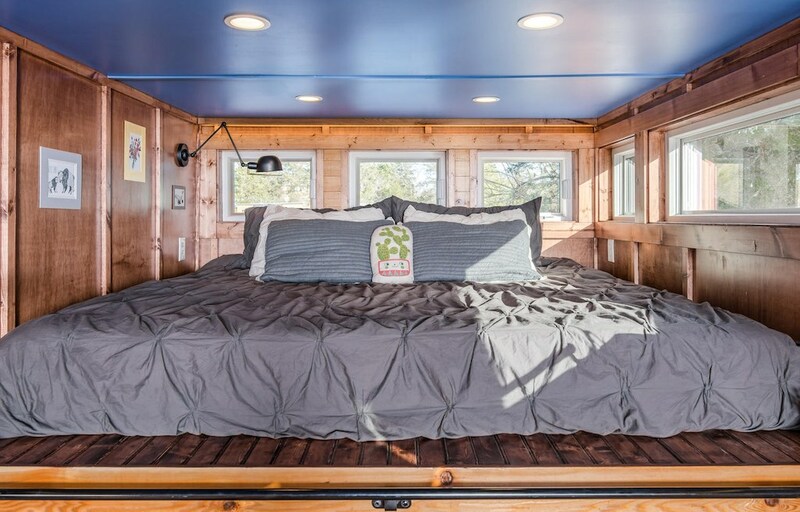 Beautifully crafted, looks roomy. Needs shower for full time living. I don’t see a refrigerator? I still love it – but refrigerator? Not much good without those! And a “honey pot” toilet! No thanks!!!!! Refrigerator, stove, storage? Price, footage? also how to wash clothes? 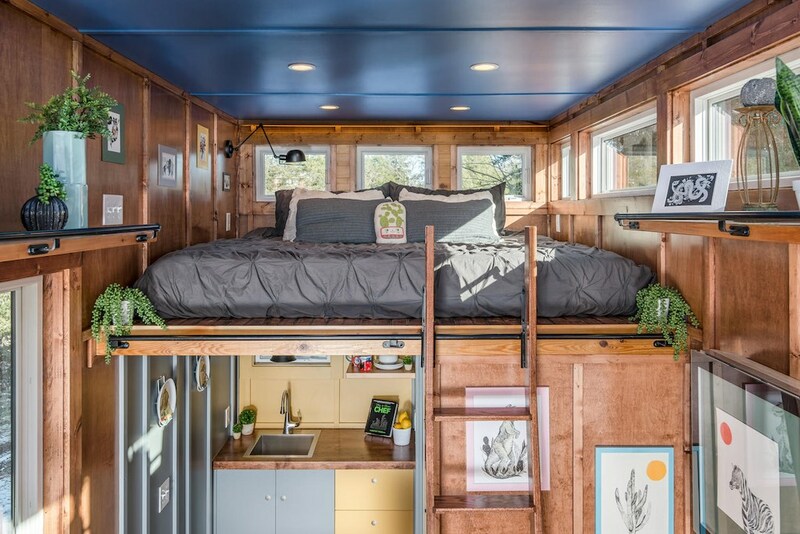 Squarefeet on this tiny house?!. 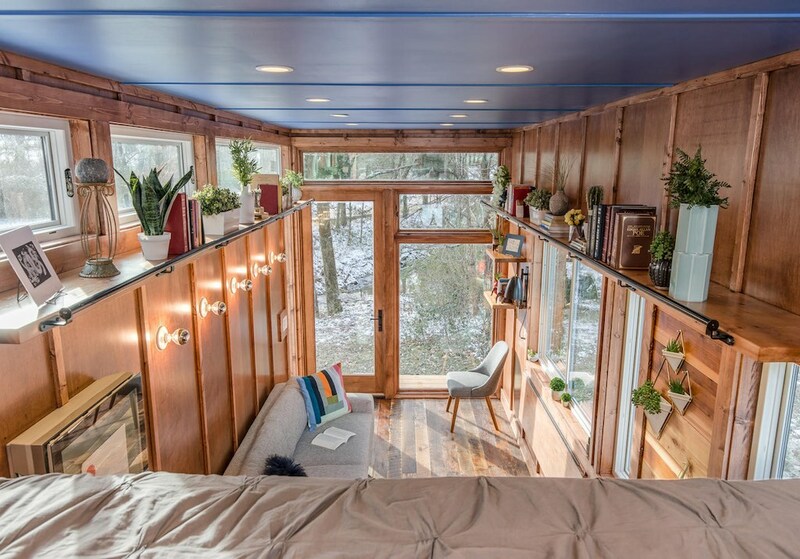 The refrigerator is right next to the bed as you come down the steps.